This morning I received this email from Rob Keck, former CEO at the National Wild Turkey Federation and now Director of Conservation at Bass Pro Shops. Our hunting and fishing heritage is important to you and me – and Mitt Romney understands its importance to America and how it positively impacts the quality of life for all Americans. You get to know a lot about an individual when you’re at a hunting camp or out in the field or on the mountain, and that’s exactly the experience I had two seasons ago with Mitt Romney, Mitt Romney is man of great integrity and character. He has a solid vision, and plan, as well as a deep and abiding love for America. He understands and respects the passion of our sportsmen and women, hunters and anglers, conservationists, and recreational shooters. As we all know, our country needs a turnaround. We aren’t better off than we were four years ago. Under President Obama our debt has soared, burdening our children and grandchildren and mortgaging our future. We can and we must do better. We need a president that understands the economic importance of hunting and fishing. We need Mitt Romney! As sportsmen, our rights to enjoy the outdoors are under attack from this administration. But, we do have a choice in this election. We can send a man to the White House who will protect our gun rights and preserve and expand our access to our precious public lands we hunt and fish. We can’t achieve these results alone. We need your help! You can make a difference. Click on the links below to get involved with the campaign. There are undecided voters out there who could decide this election. We need them to support Mitt. Sign up to make calls to likely voters in swing states. The Romney for President Call from Home program makes it easy to make calls on your own, or host a call party! Sign up and get started here. Live in or near a swing state? Find the closest Victory Center and sign up to help directly on the ground in that state. Visit http://www.mittromney.com/states to find information and get started. Thanks for answering the call to the future of our hunting and fishing heritage and to the greatest nation on earth. The Romney Campaign is reaching out to sportsmen in this final push to the finish line. It is supposed to be a messy weekend this weekend so what better time to sit down at the kitchen table and volunteer a couple of hours calling voters to Defend Freedom and Defeat Obama. Posting has been light the last couple of weeks, mainly because I have been on vacation and have been spending a lot of time with the family. I did take a little time to do some hunting the last couple days of deer season and yesterday marked the end of another deer season in Virginia. I did not get to go a lot this year but it was still a successful season. I only saw one deer the entire time I was on a stand but it was a buck of a lifetime for me. A huge eight point buck walked directly toward my stand within the first hour on the first day of muzzleloader season and I had it on the ground ten minutes later. I’m not one that judges the success of a hunt on whether I bag a deer but I have to say, that hunt was at the top of my list. The other times I was able to get in the woods this year were great even though I did not see a deer because I saw a lot of other wildlife like wild turkeys and even saw a red fox on Friday. I will spend the months between now and next season scouting for more deer trails and putting out mineral blocks for supplemental nutrition in hopes of seeing more deer next year. But for now, I will savor the memories of another season that is gone and the biggest deer I have ever had a chance to take. Gun owners have already been treated to the nomination of anti-gun Eric Holder as Obama’s pick for Attorney General. Wh should be wary of who he may pick at Interior and EPA as well. On Friday, December 12, Greg Lawson, Director of Communications for the U.S. Sportsmen’s Alliance was on NRA News‘ Cam and Company. Lawson talked to Cam Edwards about the speculation surrounding who will become President-elect Barack Obama’s Secretary of the Interior. Lawson said two names have moved to the head of the pack: U.S. Representatives Raul M. Grijalva (D-AZ) and Mike Thompson (D-CA). Rep. Grijalva is a favorite of the anti-hunting crowd. He received a 100 percent rating from the Humane Society of the United States (HSUS) in each of the last six years. In Defense of Animals, another large anti-hunting organization, issued an action alert to its followers asking supporters to contact the PResident-elect’s transition team and urge Rep. Grijalva’s appointment. Additionally, the HSUS’ legislative arm has come out in support of Rep. Grijalva. Of interest to gun owners, Grijalva was rated an “F” candidate by the NRA in 2008. Rep. Thompson’s HSUS approval rating last year was 58 percent. Thompson is a sportsman, a member of the Congressional Sportsmen Caucus, and was endorsed by the NRA-PVF in 2008, receiving a rating of “B+”. The U.S. Sportsmen’s Alliance signed a letter, along with other conservation organizations, encouraging his consideration by the new administration. While many of the daily issues that affect sportsmen are dealt with at the state government level, the Secretary of the Interior wields great influence, overseeing key conservation agencies like the U.S. Fish and Wildlife Service. Interested sportsmen are encouraged to contact the Obama transition team and let them know their thoughts on this nomination. You can contact the head of the team, John Podesta, by faxing 202-682-1867 or emailing John.Podesta@ptt.gov. You can also click here and send your comments directly to the transition team web site. Over at EPA, Lisa Jackson’s name has surfaced as a possible nominee to head EPA. Jackson played a pivotal roll in New Jersey’s cancellation of its balck bear hunting season. As head of EPA she could do the bidding of the anti-hunting groups by setting rules related to the use of lead ammunition – rules that could be detrimental to hunters and shooters. She could also play a role in reducing access to public land for hunting. While the Interior Department has over site of federal lands, the EPA could use environmental concerns as a means of trying to restrict use of those lands. Sportsmen and gun owners need to remain vigliant. If Obama appoints individuals with verifiable anti-hunting records, it will be one more sign that Obama’s rhetoric on the campaign trail was meant to divert attention form his real record on issues important to gun owners and sportsmen. Update: The Campaign Spot is reporting that Obama has chosen Colorado Senator Ken Salazar as Secretary of the Interior. In 2004, Salazar received a “D” rating from the NRA-PVF but he has been no friend of HSUS. According to Project Vote Smart, his ratings from HSUS have been no better than 50% and have mostly been 0-25% support for HSUS legislation. Posting has been light. I was on a family vacation last week and I am just catching up. I found some updated information on the Hunting with Hounds issue over on Andy Thompson’s RTD Outdoor Blog. Based on Andy’s post, DGIF is “in the middle of the regulatory process” and will be working with the General Assembly Sportsman’s Caucus on any changes to Virginia’s “Right to Retrieve” law. You can find more information here. As Virginia’s hunters await the opening of general firearms deer season on November 15th, the Humane Society of the United States (HSUS), the largest anti-hunting lobby in the country, is pushing for a nationwide ban on lead ammo. Using a recent CDC study by the North Dakota Department of Health and the U.S. Centers for Disease Control and Prevention, they claim the preliminary findings show North Dakotans who ate wildlife killed with lead bullets had higher levels of lead in their blood than people who ate little or no meat from wild animals. 1. Consuming game harvested using traditional hunting ammunition does not pose a human health risk. 2. Participants in the study had readings lower than the national average and well below the level the CDC considers to be of concern. 3. Children in the study had readings that were less than half the national average and far below the level the CDC considers to be of concern. 4. The study showed a statistically insignificant difference between participants who ate game harvested using traditional hunting ammunition and the non-hunters in the control group. 5. 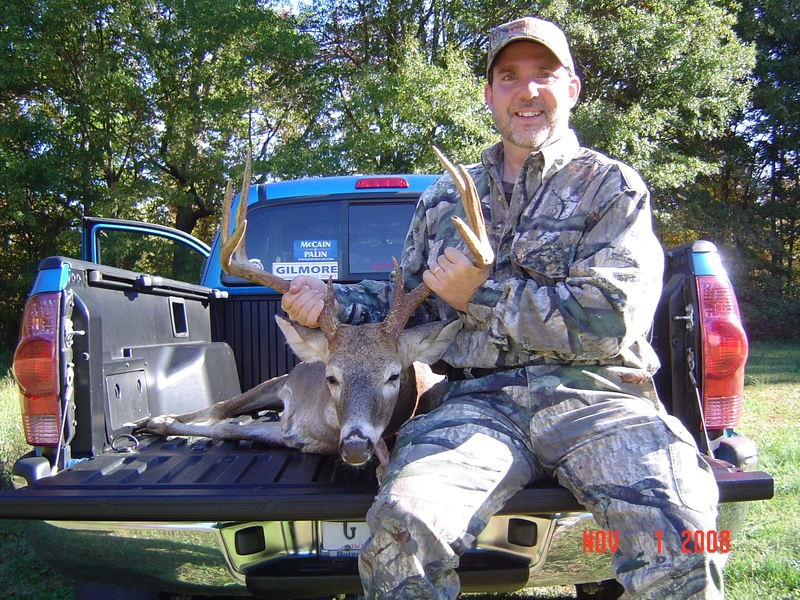 Hunters should continue to donate venison to food pantries. Just as anti-gun groups know that a total ban on gun ownership is nearly impossible, the anti-hunting groups know an outright ban on hunting would be equally impossible to achieve. So as anti-gun groups seek other ways to make it harder for gun owners to exercise their rights, the anti-hunting groups seek to dismantle the culture of hunting and banning lead ammunition is the first step of this larger political mission. They have already won this battle in California and sensing they will have a friendlier ear in the White House, they have set their sights on the entire nation. This morning was a great morning for Deer Hunting. Temperature was in the mid 40s but the forecast was for a quick warm up to the low 70’s so my hope was to see something – anything but a button buck – and have an early morning kill then leave the woods before it got too warm. God was smiling on me because less than 30 minutes after sunrise this beauty came walking through the woods straight toward me. I don’t have a lot of shooting lanes where I have my stand so I had to hope he would walk into one of them. Sure enough, he did and at about 13 yards I dropped him. It is the largest buck I have ever taken.